On the way into London from Heathrow Airport, our cabbie asked if we had heard of the “iceberg houses”. 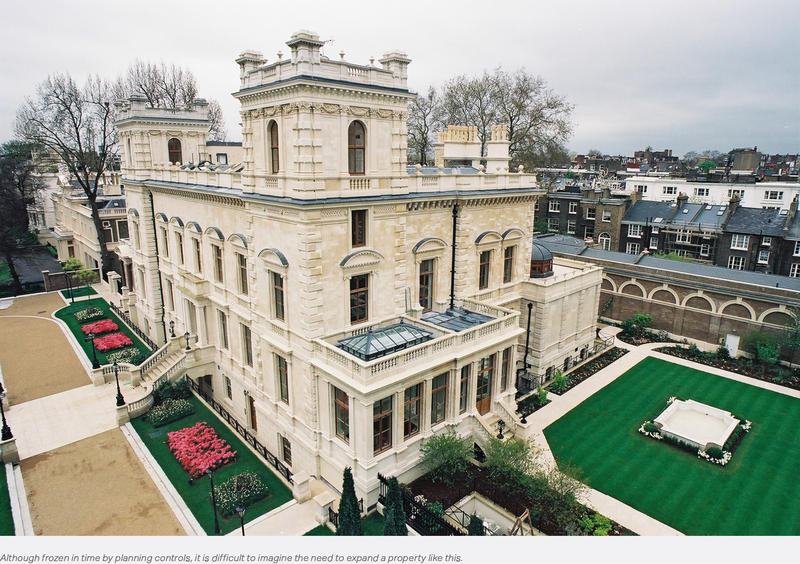 We were told the uber-wealthy of London’s most posh districts had been expanding their mansions downwards, at times to the chagrin of their neighbors and local building officials. The “additions” are not just modest wine cellars, but extend down four or five stories and contain screening rooms, spas, all kinds of gymnasia, and in at least one instance, an antique car museum! Why? Planning and zoning controls, for starters. Most of these expansions are in historic enclaves like Kensington and Chelsea where even minute alterations to the exterior envelope of centuries-old houses are prohibited. As a consequence, real estate values in these boroughs are astronomically high, so even risky, expensive construction can yield a significant return on one’s investment. The original occupants would be surprised, given that they conveyed their social status by means of the tasteful exteriors of these distinguished buildings – a clear illustration of Thorstein Veblens’ notion of conspicuous consumption. 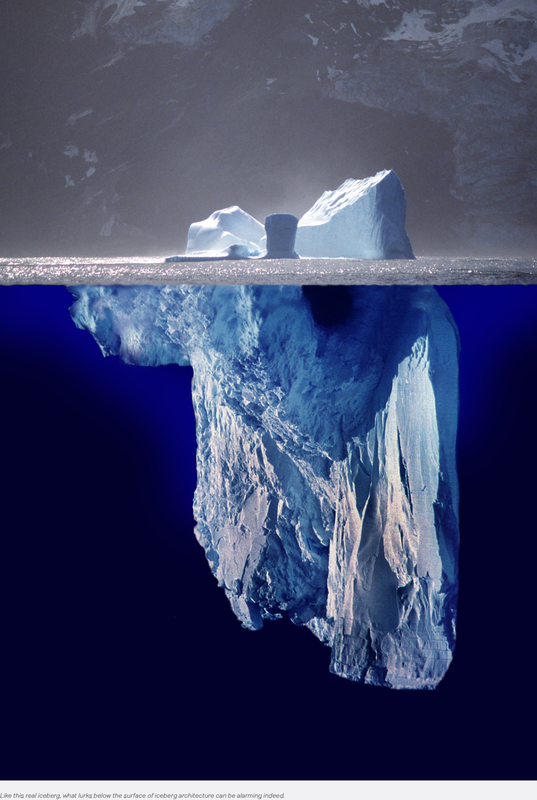 But like icebergs, the expanded structures hide more beneath the surface than they expose above it – a kind of inconspicuous consumption. Although Veblen’s tenet continues to ring true in less affluent social strata, inconspicuous consumption is more the norm for the wealthy. Elizabeth Currid-Halkett argues in a recently published book, The Sum of Small Things, that the “aspirational class” of financial elites is more apt to spend money on yoga classes than on flashy jewelry and fast cars. Perhaps the urge to build downwards is a means to confirm that one’s wealth allows them to do whatever they want just because they can get away with it. The overly wealthy seem to have enough resources to exploit loopholes in regulations that don’t even exist. 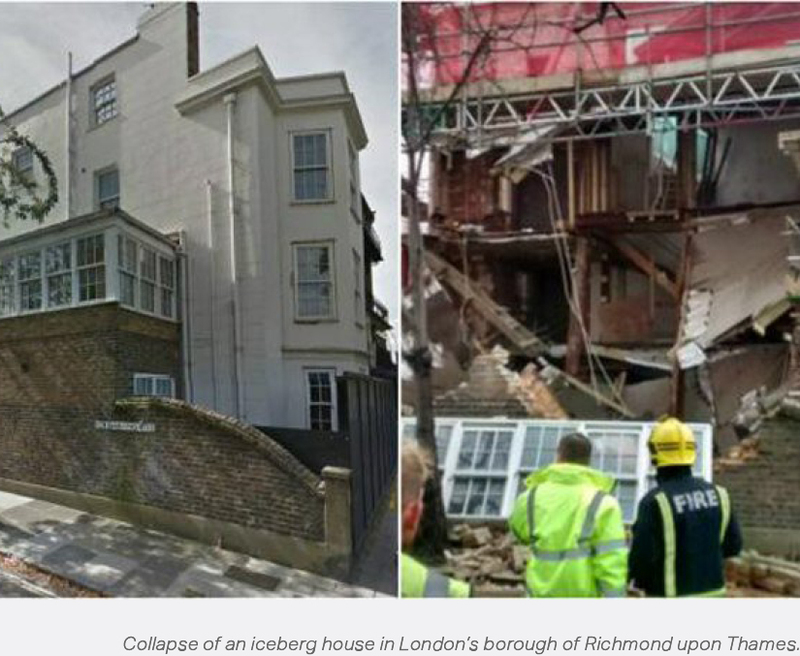 In the decade prior to 2012, the iceberg phenomenon had become well established in London, with over 800 permit applications submitted for basement expansions. But now, new regulations have been instituted to limit the scope of underground developments, mostly because of problems experienced by neighbors ranging from disruption caused by construction to near catastrophic foundation failures of adjacent properties. In fact, many foundation-related building problems are not caused by overloading of the bearing stratum, but are due to subsidence or removal of below grade material. At the bottom of a footing, a pressure bulb develops which creates a horizontal force usually resisted by material confining the foundation on all sides. Digging deeper on one side of a footing undermines it, because that side no longer has anything present to resist this horizontal force. In San Francisco, the 58-story Millennium Tower is tilting in part because ground water has been pumped out of an adjacent site. However, when properly engineered, below grade construction can be safely executed, but it requires a well-choreographed transfer of vertical and horizontal loads from shoring onto permanent structure. Apparently, some of the owners of London’s iceberg houses not only snubbed their noses at building regulations, but at the laws of physics as well. Imagine how iceberg architecture could play out here in the colonies. There certainly are parts of the country where extreme wealth is congregated and both real estate values and planning constraints are steep. 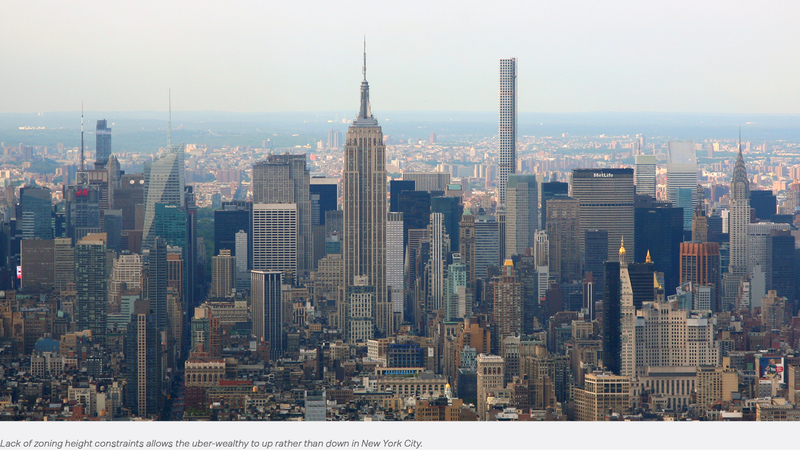 The “pencil skyscraper” in New York emerged to exploit these factors because height is not regulated in the city that never sleeps. San Francisco, perhaps the most highly regulated city in the country, has not closed a routinely exploited loophole in the California Civil Code governing underground construction. On the books since 1872, Civil Section 832 gives property owners the right of “lateral sub-adjacent support” for up to 8 feet below grade. According to this statute, an owner need only notify a neighbor of intent to excavate, and allow access so the adjacent owner can reinforce or underpin structures that might be on or near the property line. Most reasonable developers pay for stabilizing the neighbor’s structures, but hardball players do so only under the condition that the neighbor will not oppose the developer’s proposal. Hopefully the uber-rich in this country can find better uses for their soon-to-be acquired tax windfall than to embrace iceberg architecture. However, wealthy clients do allow some of us to pay our bills – perhaps our employment illustrates how trickle down economic theory works, albeit at a scale that doesn’t move the overall economy much. All things considered though, we should keep our pencils above grade most of the time. And we should support theories that preserve real icebergs before they trickle away completely.